Welcome! To navigate our site and quickly find what you're looking for, please use our button menu, above. 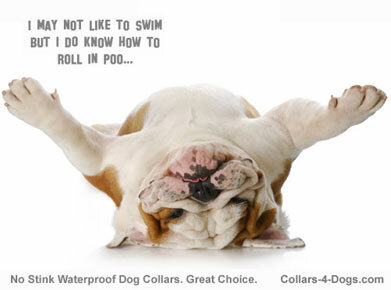 waterproof, no stink dog collars! 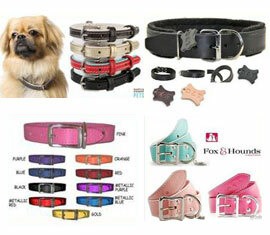 From leather dog collars to nylon collars and leashes (leads). From personalized dog collars to training collars and aids. From cheap dog collars to designer dog collars and haute couture. Most of our "plain" leather dog collars do not look plain at all... in fact, some are masterpieces of leather craftmanship! This is because in our website's dictionary, "plain" just means that the collar has no studs, no spikes nor any other metal or riveted ornaments. They are flat leather collars. small dogs with a big attitude! 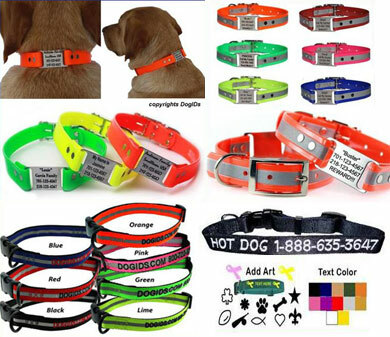 Your dog is your friend and protector, so it only makes sense to get them accessories which express that. Spiked collars give a little extra edge in your dog's bark. We have extra large and extra wide collars for the really big dogs, and extra small spiked collars for the small and tiny ones. 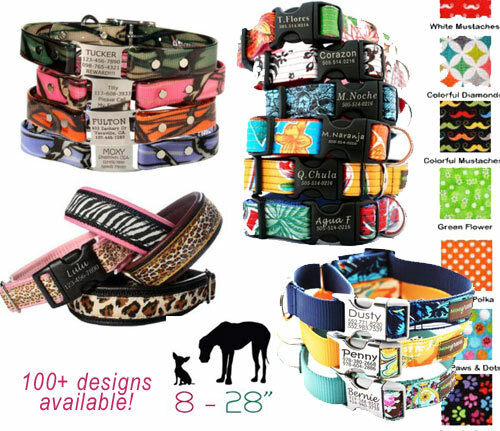 With most of these collars, matching leather leashes are available, too! 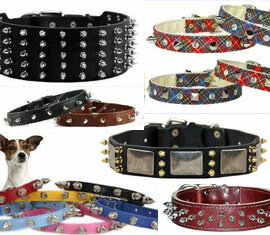 Our awesome studded dog collars range in suitability for teacup size to the giant dog breeds. With classic studs, or metal emblems, conchos, buttons, plates,... For wild, biker dogs. For a classic and chic look. For timeless beauty. For a fierce look and for brawny dogs. Oh well, just because they're so beautiful! 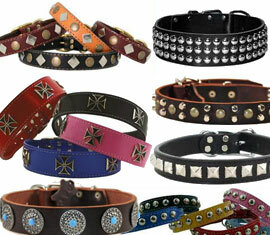 Neck sizes from 16" up to 35"
Most of the Dean and Tyler collars are leather collars, many are spiked, studded or plated. Perfect for big dogs and (extra) large dog breeds! Medium sizes available. too. Besides product information we offer a price comparison between 4 major D&T retailers in the US and in the UK. Matching leather leashes are available as well, and studded dog harnesses, too! Neck sizes from 8" up to 26"
a brawny look, for tiny dogs too! 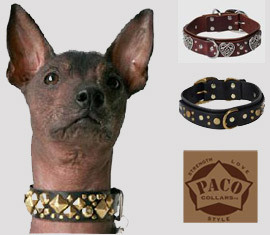 Paco Leather Dog Collars: "a company dedicated to enhancing you and your dog’s natural style with quality leather products. Each piece is handcrafted with its future owner in mind, making every collar, belt or bracelet as unique as the one who wears it. Custom design work is our specialty!" All sizes, from extra small up to extra large. Collars with studs, metal emblems, conchos. 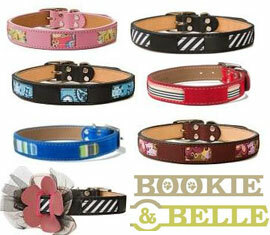 Neck sizes from 11" up to 21"
Casusal chic and stylish classy designer dog collars, by Bookie and Belle. Handmade, high quality leather and suede. Leather collars, with paisley, camo and striped ribbons. For small, medium, and large dogs. Flower slide-on accessories available, too. Neck sizes from 6" up to 26"
Neck sizes from 6" up to 25"
If you are having a hard time finding a dog collar that is both fashionable and long lasting, your search is finally over. 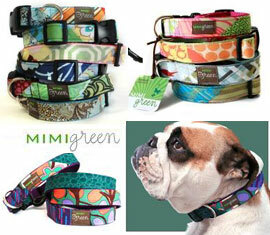 Mimi Green collars are all customizable by size and they can even personalize the collar with your dog's name! 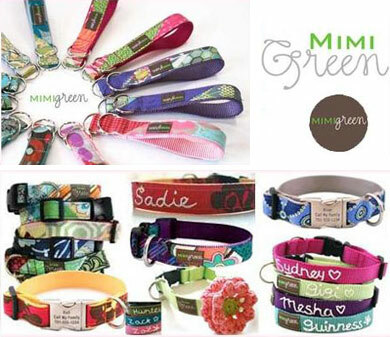 Whether you choose a hand embroidered personalized dog collar or one of their classic dog collars, you will be impressed with how strong and unique Mimi Green dog collars are! 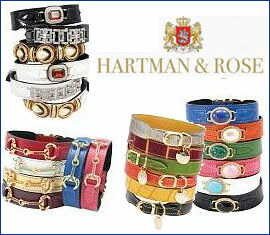 Neck sizes from 8" up to 24"
Hartman & Rose specializes in the finest luxury dog collars and leads. Using exquisite natural Italian 100% full-grain vegetable dyed eco-friendly leather combined with elegant Italian hardware. Inspired by the classic appeal of Hermes, Cartier, Gucci, Fendi and more. Natural gemstones and Austrian crystals are placed in the trademark settings which are plated with 22kt. gold, polished nickel and other illustrious finishes. Neck sizes from 4" up to 28"
Whether for Yellow Dog collars, leashes, harnesses or couplers; each design starts as an original work of art created by a Yellow Dog Design owner. They have an eye for the hottest trends, and years of experience creating top selling dog designs. Yellow Dog is dedicated to keeping the line of dog collars, leashes, harnesses and couplers fresh and exciting and full of hot best sellers! Affordable fashion for your dog. From cheap dog collars to designer dog collars and haute couture, you ll find it here. 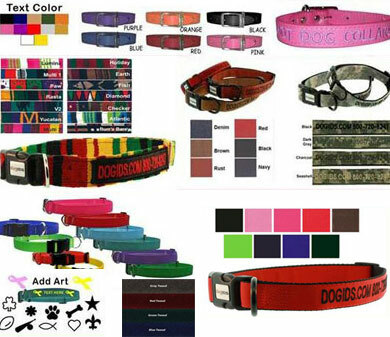 In black and brown, pink dog collars, blue dog collars, purple dog collars, green dog collars, bling dog collars,etc. Solid colors and fashion designs. Matching dog leads too! Dog Collars, What Type is Best for My (Problem) Dog? 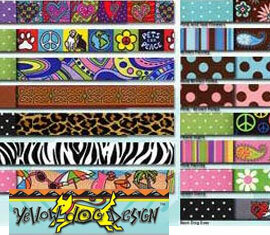 Dog collars, so many to choose from! Wikipedia writes: A dog collar is a piece of material put around the neck of a dog. A collar may be used for control, identification, fashion, or other purposes. An excellent definition! But since there are so many different types, which one should you buy? 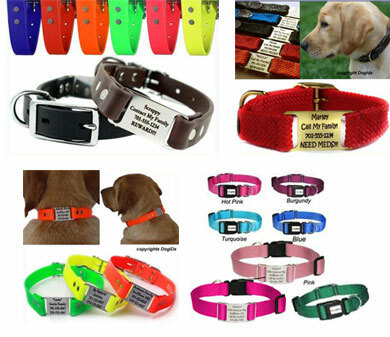 What type of dog collar is the best? Well, let me tell you straight away: the best dog collar does not exist! No matter what some manufacturers may want you to believe. Every dog is different. In size, proportions and temperament. Every dog owner is different. Some owners want to buy a collar simply because they need something to attach a leash to. Other owners look for a collar that will make their pet look beautiful, brave, or funny, or let their dog stand out in a crowd. A dog collar can be a fashion statement, for sure! Then there are dog owners in search of a collar to get control over their disobedient dog. If you are one of them, please be advised, a collar is no good answer to solving bad dog behavior. Depending on the type of training collar you would use and on how exactly you would use it, a training collar may have some positive effect -- for a short while. But it may cause your best animal friend to no longer trust you. And in the worst case, it may cause problems to intensify. I've seen this happen many times. 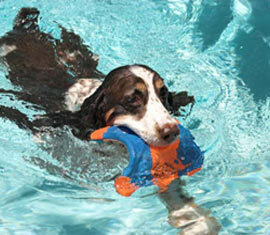 I have been a professional dog trainer and dog behavior counselor for more than 15 years. The key to a well behaved dog is in the basic relationship between owner and pet, and in training the desired behaviors, using positive reinforcement. If you want to know more, search the internet for websites about clicker training. 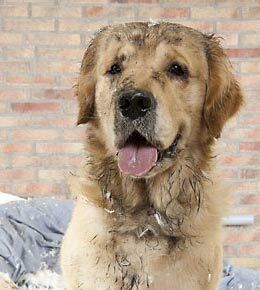 Read about dog psychology. Two books that I heartily recommend on this topic are John Fisher's Think Dog! and Jean Donaldson's The Culture Clash: A Revolutionary New Way to Understanding the Relationship Between Humans and Domestic Dogs. These are two of the books that changed the way I thought about dog training and problem dogs for good, many years ago. Back to the dog collars! So, what type should you buy? My answer is that any dog collar can be the best for your dog, as long as it is comfortable to wear and can not cause any harm or danger. Buy what you like, and spend what you are willing to pay. The best collar for you and your dog can be a plain and inexpensive nylon collar, or a haute couture designer dog collar, custom made for you and your best friend! But please, don't buy a dog collar, no matter what type, in the assumption that it will solve your dog's problem behavior. Karen has been a professional dog trainer and dog behavior counselor for more than 15 years. This article about dog collars has been originally published on her website, Collars for Dogs, Dog Collars and Leashes. You are allowed to use this article on your blog or website if you like, but only with our written permission and including the links and copyrights notice that come with this article. Send us a message if you'd like to use this article. Thank you! From leather to nylon. 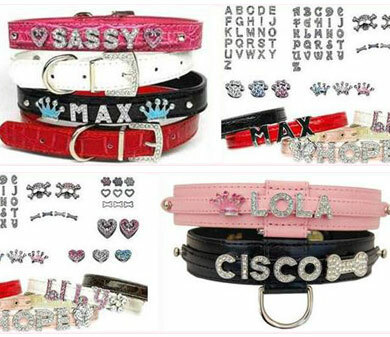 From personalized dog collars to fashionable bling. 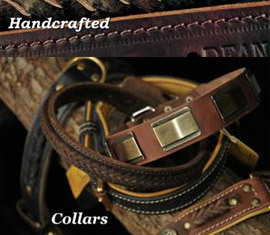 From inexpensive dog collars to designer and custom made. In black and brown, in pink, blue, purple, green, red etc. Solid colors and fashion designs. Matching dog leashes too! There is just something about having your dog's name and contact info embroidered directly on his collar so no tags to worry about. 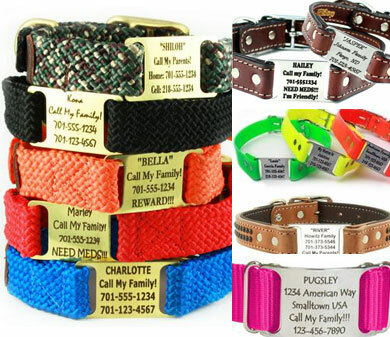 Or, instead of those noisy, metal or plastic ID tags, buy a beautiful dog collar with custom text engraved on a name plate. Choose for leather, nylon, double braid or other fabric. Many colors, patterns and styles. All sizes, from low priced up to uptown designer. Matching dog leash collections available (see our dog leads and leashes). Nameplates available in stainless steel, polished brass and chrome plated metal. 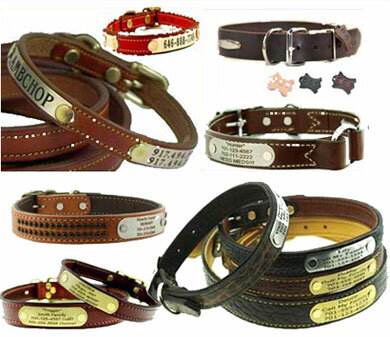 In case these leather, fabric and nylon personalized dog collars are not what you're looking for, have a look at all our different dog collar categories: from leather dog collars to nylon, from simple and cheap dog collars to fancy, fashion, fashionable, cool designer collars and haute couture! Inexpensive fabric and nylon dog collars, harnesses and leads, on super sale! Discounts up to 70% off.